Here is another delicious and nutritious breakfast recipe you can make ahead. Oatmeal is considered a “super food”, since it is dense with nutrients like dietary fiber, protein, vitamins and minerals. If you don’t like oatmeal, because you think it has to be mushy, or runny, or tasteless, this recipe might change your mind. 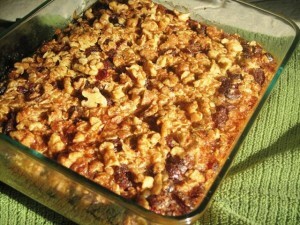 Today’s recipe is for baked oatmeal and served hot, or prepared ahead and heated up before serving. In a large bowl mix all dry ingredients and set aside for now. In a medium bowl, beat the eggs with milk, salt and vanilla. Mix in melted butter. Grease the bottom of a 9 x 9 cooking pan with cooking spray. Place the chopped apples on the bottom of the greased pan. Pour the dry ingredients mixture over the apples. Sprinkle top with additional cinnamon and walnuts. Bake in preheated oven, at 325 degrees F, for 60 minutes. Cover and refrigerate left overs for next day, or spoon into individual serving dishes for easier heating.